The King County GIS Center's popular GIS Academy™ completed another successful run this October in our convenient downtown Seattle GIS training facility. Launched in 2008 as the GIS Boot Camp, the GIS Academy combines a number of our custom GIS Training Express™ classes into a weeklong, integrated, work-problem-based curriculum. The GIS Academy is designed to develop students’ abilities as they apply their growing skills to a sequential class project. By the end of the week, students depart with new confidence to tackle more challenging assignments with enhanced productivity. Thirty-three students have now completed the full GIS Academy and another 211 students have attended individual classes either during the Academy or when presented as stand-alone GIS Training Express events. Thank you so much for administering such a great GIS Academy!!! I learned tons and even showed a co-worker today the intersect tool and what it can do for us! Yay! I have been able to apply some of what I learned already! So thanks for great production. Adam was great! Very knowledgeable! Thanks. I learned how to use Model Builder and realized I can use this at work for some data processing. I learned useful examples to follow when I try to build my own models and gained a contact person to call about issues encountered in real-world model building. Great class! Great tools! Now I need to practice. Mary is an excellent instructor. Great alternative to Esri virtual training – I like the classroom setting so I can focus on study and learning. A challenging subject met head-on with lots of research to make it more palatable to the user! Nicely done! What a massive subject. I thought I knew the basics from 9.3 but seeing this big leap in user interface was boggling. Most importantly, Mike steered us around some potential pitfalls. Well done. Frank is a great instructor. Good course; very thorough and informative. Frank is an excellent instructor and knowledgeable. Excellent, valuable tips & tricks for editing in V10. Packed full of excellent demonstrations using ArcGIS 10 – I am confident now going back to the office & making the switch from 9 to 10. Learned about planarize and construct polygon. Map topology demo was excellent! The 2012 GIS Academy will be offered by the King County GIS Center in the spring, April 2–6, and in the fall, October 8–12. For complete information about the GIS Academy visit www.kingcounty.gov/operations/GIS/Training/GISAcademy.aspx. The full slate of 2012 KCGIS Training Program classes and workshops is now online. From high-level topics, such as the free brownbag workshop "What is GIS?," to in-the-trenches, hands-on curriculum, such as the Esri® Certified, KCGIS-taught ArcGIS 10 Desktop class "GIS Workflows and Analysis," you'll find it here at the King County GIS Center in 2012. That also includes spring and fall sessions of our now well-established GIS Academy (the 8th Academy just completed last week!). Find our everything you need to know, including registration information for 2012, by starting right here: www.kingcounty.gov/gis/training. Kickin' down the cobblestones...to the October GIS Academy! October is a great time to ramp up your GIS skills! The rush of getting the kids back to school is over and the end-of-the-year holiday crush won't have hit yet. So trip along the cobblestones of Seattle's historic Pioneer Square to the King Street Center where the eighth edition of the King County GIS Academy is set to kick off on October 10th. Once again the Academy will offer its tried-and-true, hands-on classes for the working professional taught by working professionals. Throughout the integrated curriculum of core GIS topics, participants enjoy small class size, flexibility of choice (they can take just one or any combination of the classes), and personal instruction from specialists in each topic. To date, scores of students from more than forty public agencies and private companies throughout the northwest and farther, as well as private individuals, have advanced their professional GIS skills in the King County GIS Academy. Because the Academy classes are taught by GIS analysts and programmers who daily perform the activities they also teach, the Academy coursework is kept current with advances in GIS technology and practice. For example, this October attendees will reap the experiences of KCGIS Center staff who have been testing, implementing, and using all aspects of Esri’s ArcGIS 10. Register now to ensure that you can harvest the benefits of all this experience for yourself this fall. It's easy to see the full roster of King County GIS Academy classes and find out all you need to know about registration and logistics on the Academy web page. But the Academy is just one of a broad range of GIS training opportunities that are offered by the KCGIS Training Program throughout the year. From Esri-authorized classes to free brownbag workshops to classes presented by our training partners and hosted here in our conveniently located facility, you can find numerous ways to increase your knowledge, enhance your skills, and keep your GIS career moving forward. Get your start right here on the KCGIS Training Program home page. A Puget Sound area coalition of King County, cities, the USGS, and utility and service districts is planning to acquire high-resolution orthoimagery and ancillary products in 2012, all at a significantly reduced cost to participants thanks to its collaborative effort. The project proposes to acquire imagery at three resolution levels across a broad project area that encompasses all of King County and large portions of adjacent counties. Several agencies have worked together to develop a funding agreement, project framework, cost-share model, and the preliminary project extent. Development of the scope of work continues, with a contract and participant fund commitment due to be in place by the end of the year. Image acquisition is scheduled to begin in mid-March 2012. King County will coordinate with interested parties to provide new or updated area of interest information which will be used to adjust the cost-share model. Interested parties can contact Mike Leathers, Project Manager, King County GIS Center, for an executive summary and other documentation. 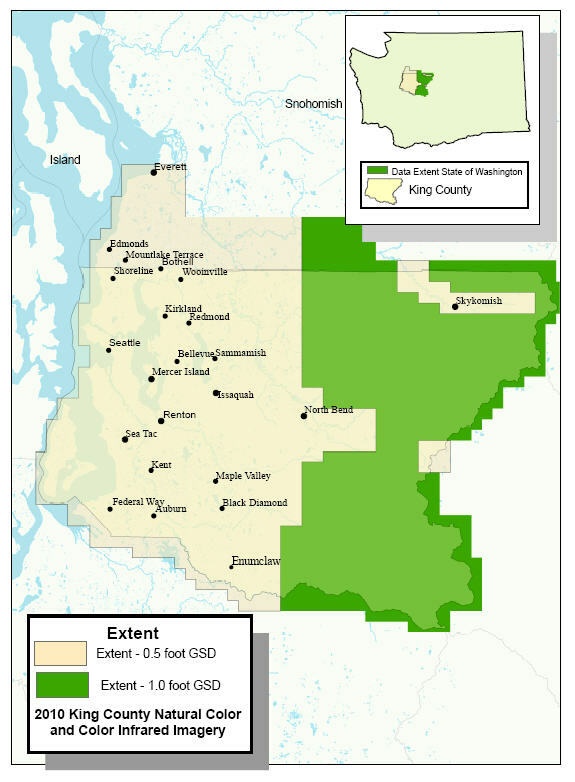 Late in 2010 the KCGIS Center accepted high-resolution (0.5-foot-per-pixel), leaf-off, orthographic aerial imagery of the western portion of King County and southwestern Snohomish County, which was captured earlier in the year, and made it available to local cities and agencies via cost-sharing arrangements. Lower-resolution (1-foot-per-pixel) imagery of the eastern, upland portions of the county, which was captured in August of 2010, is now in the KCGIS imagery database, which brings the 2010 project to a close. Interested government entities that have not yet requested this natural-color and color-infrared imagery are encouraged to contact the KCGIS Center to learn how to take advantage of this valuable resource for their own jurisdictions and projects. The digital data from King County’s two previous aerial imagery projects in 2007 and 2009 are available through similar cost-share agreements. Oblique-only 2011 imagery will also be made available via cost sharing. Although the previous and current cost-sharing arrangements have helped local government partners acquire aerial imagery at reasonable costs, GIS departments, public-works agencies, and other government groups recognize the need for even more effective prior coordination and planning for future aerial imagery acquisitions. With this in mind, initial planning has begun to form a broad consortium that comprises King County government, city governments, and other area agencies, such as fire, sewer and water utility districts, to fund and execute a joint 2012 (late spring) ortho-imagery acquisition project. A formal funding agreement will commit partners to individual not-to-exceed contributions based on a consortium member’s area of interest. Jointly developed specifications, and a defined budgetary commitment from the member agencies, will help ensure an efficient imagery acquisition project with deliverables that meet the requirements of all of the participants. More information regarding the 2012 project, including the details of the proposed funding agreement, will be available in the near future. Potential partners are encouraged contact Mike Leathers of the KCGIS Center with questions or to express an interest in participating in the consortium. University of Washington Transportation Services and King County Metro Transit have teamed up to publish a revised edition of their popular Get Around map guide to the neighborhoods near the University of Washington. As with the original 2005 edition, King County GIS Center Client Services provided data and cartographic design and production services to round out the data collection and map development efforts of UW staff and students and Metro staff. The pocket-size “U-District & North Capitol Hill” map guide includes updated information in all of the original feature categories, such as, bike and bus routes, activity destinations, and neighborhood services and retail options. And it contains key new features. For example, a handy list of bus routes to and from the Eastside that cross the Evergreen Point Bridge offers options for cross-lake travel that will take on special value when bridge tolling goes into effect this summer. Also new in the 2011 edition are networks of pedestrian walkways and trails in and around the University of Washington campus and the larger parks in the vicinity, such as, Magnuson Park, Ravenna Park, and Washington Park and Arboretum. Many more art and cultural sites and neighborhood landmarks are identified than in the first edition too, so the maps are better than ever for neighborhood navigation and exploration by bus, bike, or foot. From the Jimi Hendrix statue on Broadway on Capitol Hill to the new Magnuson Park wetland trails, there’s a wealth of discoveries and a variety of experiences waiting for the map user. And since no map is an island, plenty of additional car-free-mobility resource links are included. While supplies last, high-quality, offset-printed copies of the map guide can be picked up for no cost at two locations. In the University District, the maps are available in the lobby of the UW's University Transportation Center, 3745 15th Avenue NE (external link). In Pioneer Square in downtown Seattle, the maps are available at the Map Counter of the King County Road Services Map and Records Center, 201 South Jackson Street (located inside King Street Center, enter from the first-floor lobby). Copies are also available by mail. Send requests to metro.promo@kingcounty.gov. On the Internet, Adobe Acrobat PDF versions of the Get Around map guide can be viewed at, and downloaded from, the King County GIS Center’s Virtual Map Counter. For the past five years, the King County GIS Center has been a key part of the Seattle Metropolitan magazine (Seattle Met) annual real estate report. Seattle Metropolitan discovered the KCGIS Center in 2007 when they were seeking data on assessed values and sales information by neighborhood. KCGIS Center staff worked with the magazine to create a custom analysis of annual sales of single-family residential homes and condominiums using Seattle Metropolitan’s custom neighborhood designations. The KCGIS Center staff’s unparalleled understanding of the necessary public data sets allows the magazine to provide an important look at the real estate activity of the Seattle area to their readers. Accurate and fast analysis, along with close interaction with magazine staff, are the keys to this recurring project. The project has evolved over the years to include analyses for census population and household information, proximity to bus stops, bike lane miles by neighborhood, political affiliation, and even a look at pet licenses! Seattle Metropolitan is a valued partner and we look forward to working with them every spring to update their unique, useful and informative annual real estate report. The King County GIS Center congratulates the accomplishments of staff member Mary Ullrich who has achieved both ArcGIS Desktop Associate and Esri Certified Trainer status, with the qualifications and authorization to teach ArcGIS Desktop 10 courses. By fulfilling the rigorous requirements of the Esri Certified Training Program (CTP), Mary has demonstrated her depth of knowledge and proficiency with ArcGIS 10 software. The Esri CTP also requires that its trainers achieve CompTIA certification, which Mary had previously earned (see “King County instructors achieve Certified Technical Trainer status”). This ensures that Mary's students will benefit from her recognized excellence in teaching in addition to her keen handle on ArcGIS 10 software. Mary has been on the staff of the KCGIS Center since 1999. As a working GIS analyst in the Client Services group, she understands the perspectives and needs of her students. Mary is also an experienced trainer, having taught the ArcGIS Desktop series of classes for versions prior to ArcGIS 10 for more than three years as an Esri-authorized instructor. Already a team in helping to develop and implement the KCGIS Training Program, Mary now joins colleague Cheryl Wilder among the exclusive number of GIS professionals who claim the title of Esri Certified Trainer. From July onward the ArcGIS Desktop classes that Mary and Cheryl teach will be ArcGIS 10. To see the full range of GIS professional training opportunities offered by the KCGIS Center, including the current calendar and course catalog, visit www.kingcounty.gov/gis/training. With a sponsorship role, exhibitor's booth, and multiple presentations, King County GIS will be well-represented at WAURISA's fourteenth annual Washington GIS Conference on May 9-11 in Lynnwood. King County GIS staff will also be presenting each day of the conference starting off on Monday morning with Greg Babinski, KCGIS Center Finance and Marketing Manager. Greg will be leading the workshop titled “URISA GIS Capability Model and Geospatial Competency Model” which will provide GIS managers, supervisors, and other GIS policy makers an opportunity to participate in the ground-breaking development of GIS industry models. Also on Monday, Michael Kulish, a supervisor in King County’s Road Services Division, will present the workshop, “An Introduction to Land Surveying for GIS Technicians and Professionals.” What a great opportunity this will be for GIS professionals to gain insight into a critical professional practice that contributes to, interacts with, and influences the broader GIS profession so much. On Tuesday morning, Greg Babinski will be a panel member in one of the first of the day’s technical sessions, “Mapping Washington’s Future.” And in the afternoon, Mike Leathers, the KCGIS Center’s GIS Data Coordinator will present “King County GIS Data To Go!” where attendees can learn about the KCGIS Center Data Portal which provides free online access to more than 200 King County GIS data layers. Greg Babinski presents again on Wednesday with “ROI: King County Measures the Benefits of GIS.” And in the afternoon, Harkeerat Kang, a KCGIS Center GIS analyst and application developer will team with Michael Murphy, King County Land Conservation Program Manager, to discuss and demonstrate an interactive mapping application that provides the public information about properties involved in King County’s Transfer of Development Rights Program, which has protected more than 141,000 acres of land. During vendor hall hours on Tuesday and Wednesday, conference attendees are encouraged to visit the KCGIS Center booth where staff will be on hand to discuss the whole range of services offered by the KCGIS Center. Come find out how we can help you put GIS work, whether it’s getting a fledgling GIS off the ground or taking full advantage of the GIS skills and resources you already have. An impervious surface classification delineates where the earth's surface is covered by houses, roads, parking lots, buildings and other areas that are paved or otherwise impacted by development to the extent that water cannot penetrate the ground surface. King County GIS first interpreted a countywide impervious/impacted surface GIS data layer in 2000. In 2010 the King County GIS Center developed an updated version and published it to the KCGIS Spatial Data Warehouse. To begin development of the new layer, color infrared aerial imagery captured in the summer of 2009 was spectrally analyzed to extract areas that differentiate between vegetated and non-vegetated surfaces. This initial product was then enhanced by the incorporation of nearly twenty vector data layers that represent non-natural features such as sidewalks and building footprints. Many of these layers were acquired from cities and other jurisdictions. In addition, the King County transportation network layer was buffered and inserted into the final product to improve the definition of roadway surfaces. After the process of interpretation and compilation of data sources was complete, an extensive manual review was performed. Editors removed significant areas of “commission error”—those areas where the spectral analysis captured non-impervious surfaces that have spectral signatures similar to impervious surfaces. Certain agricultural lands and saturated areas, for example, tend to have spectral signatures that result in such errors. With the methods employed it is not possible to capture all impervious surfaces. For example, areas that are masked by tree canopy or which fall below the two-foot resolution of the data cannot be interpreted. Nor is it possible to remove all commission error, but analysis of 100 control points demonstrated an overall accuracy of 94%. The first illustration, above right, shows a sample of the 2009 impervious surface layer in two shades of blue which were generated by comparing 2009 data to 2000 data. The lighter shade of blue represents data that is in both sets. The darker shade of blue represents new impervious surface data, that is, housing development, road construction and other growth in the impervious surface classification that occurred between 2000 and 2009. A full description of the data sets that were incorporated into the final product can be found in the impervious surface metadata entry in the KCGIS Spatial Data Catalog. The data can be displayed most simply by using the binary impervious/non-impervious code. Alternatively, unique codes have been assigned to each data source, which allows users to display and/or query the data by source code. The final product covers all of King County and southwestern Snohomish County. The impervious surface data are stored as 2-foot-resolution Esri file-based grid tiles at the township/range level of the KCGIS raster/grid tiling system. These grids can be imported and mosaicked in a geodatabase, and can be exported to vector feature classes or shapefiles (over limited areas). An aggregated 15-foot grid is available for each of the four quadrants of the zone tile level. The entire project area can be viewed as one 30-foot re-sampled grid. Although these data sets are not available from the King County GIS Data Portal, they can be acquired through a custom data order from the KCGIS Center. The KCGIS Spatial Data Catalog lists other landcover layers that may be of interest, including a “Manmade Feature Height” layer that integrates older lidar surface elevations with the impervious surface layer. Similarly, a “Vegetation Feature Height” layer, which combines elevation data with vegetation cover, is also available. In the second illustration, vegetation height (shades of green) and manmade feature height (shades of gray) layers are displayed together. Cheryl Wilder, King County GIS Center Training Coordinator, is now one of a small number of GIS training professionals in the United States who are authorized to use the title of Esri Certified Trainer and teach ArcGIS Desktop 10 courses using Esri-developed course materials. The Esri Certified Training Program (CTP) requires depth of knowledge and proficiency with ArcGIS 10 software, as evidenced by Cheryl’s certification as an ArcGIS Desktop Associate (see below), and the broad preparation and skill recognized by CompTIA certification (see “King County instructors achieve Certified Technical Trainer status”). Cheryl began teaching Esri courses as an Esri employee in 1996. She brought her skills and enthusiasm for professional education to the King County GIS Center in 1998 where she has been instrumental in growing the KCGIS Center Training Program. She is delighted to now be able to continue her tradition of excellence in teaching with the ArcGIS 10 Desktop series of courses. “Teaching has been one amazing ride! I’ve met so many wonderful students and I’ve been to a lot of way cool places. I am so looking forward to more wonderful adventures in unlocking hidden, yet unlimited human potential, both my own and the students, through GIS education with ArcGIS 10." Congratulations to Cheryl—and to her future students! To see the full range of GIS professional training opportunities offered by the KCGIS Center, visit www.kingcounty.gov/gis/training. The King County GIS Center is proud to announce that Cheryl Wilder, KCGIS Center Training Coordinator, has been awarded Esri Technical Certification which recognizes superior skill levels utilizing Esri’s GIS software. Cheryl was awarded the ArcGIS Desktop Associate Certification. “We’re very proud of Cheryl,” said George Horning, KCGIS Center Manager. “Her accomplishment demonstrates the level of GIS knowledge and professional expertise that the King County GIS Center stands for.” Cheryl is also a CompTIA Certified Technical Trainer and as an Esri-authorized instructor she teaches ArcGIS Desktop I, II, and III as part of the KCGIS Center Training Program. To earn Esri Technical Certification, candidates have to pass a rigorous examination that assesses knowledge and skills cultivated through years of experience as a geographic information system professional. Since Esri launched the program within the past year, Cheryl is among the first to earn this honor. Find out more about Esri Technical Certification at www.esri.com/certification (external link). For more information about the KCGIS Training Program, see www.kingcounty.gov/gis/training. The seventh edition of the GIS Academy (originally GIS Boot Camp) is underway this week in the KCGIS training facility at King Street Center in downtown Seattle. GIS Academy is an innovative offering of the KCGIS Training Program that provides a week-long series of hands-on classes in an integrated curriculum of core GIS topics, all for the working professional taught by working professionals. Participants enjoy small class size, flexibility of choice – they can take just one or any combination of the classes, and personal instruction from specialists in each topic. Scores of students from more than forty public agencies and private companies throughout the northwest and farther, as well as private individuals, have advanced their professional GIS skills in the King County GIS Academy. Because the Academy classes are taught by GIS analysts and programmers who daily perform the activities they also teach, the Academy coursework is kept up to date with advances in GIS technology and practice. For example, this week’s attendees are benefitting from KCGIS Center staff experience implementing, testing, and using Esri’s ArcGIS 10. The next edition of the GIS Academy will be presented in October of this year – to see the full roster of classes, visit the Academy page. But the Academy is just one among a broad range GIS training opportunities available from the KCGIS Training Program throughout the year. From Esri-authorized classes to free brownbag workshops to classes offered by our training partners and hosted here in our conveniently located facility, you can find numerous ways to increase your knowledge, enhance your skills, and keep your GIS career moving forward. Get your start right here on the KCGIS Training Program home page. The King County GIS Center has reached a milestone with the final publication this week of a standard set of data on disc. The two-disc January 2011 data issue, which as usual contains a broad selection of GIS data layers and tables among fifteen thematic categories, is now available while the supply lasts by appointment only from the KCGIS Center offices in King Street Center. Visit the main King County GIS Data web page for links to information about all KCGIS data topics, including distribution, data standards, and metadata.